A very well known artist in Italy, Switzerland and Austria, Giovanni Segantini is still under estimated and practically unknown in France where, unless we are mistaken, his paintings cannot be found in any museum. Orsay owns a drawingand the Musée des Beaux-Arts in Rouen holds two – in fact exhibited in Basel – from the Baderou donation. The exhibition at the Fondation Bayeler, so close to our country, is the perfect opportunity for French art lovers to discover a painter who, contrary to popular thought is not a neo-Impressionist. He is, instead, quite certainly one of the greatest artists of the second half of the 19th century. Segantini’s life was both extremely uneventful and at the same time very much out of the ordinary. He was born in Arco, Trentino region and, after losing first his mother then his father at a very early age, was brought up by a half-sister until running away from home at twelve when he then found himself placed in an institution. He received almost no education since he learned to read and write quite late, in fact after discovering his talent for drawing which he developed at the Brera Fine Arts Academy in Milan. 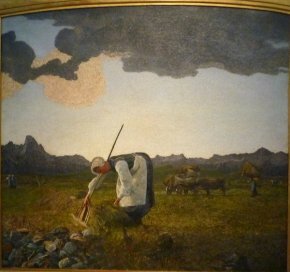 Since his sister had requested that his Austrian citizenship be annulled but had not taken the time to see that he become Italian, Segantini thus spent his entire life as a man without a country (he was naturalized as a Swiss citizen after his death), making it difficult for him to travel after he left for Switzerland in 1886, with only a few visits to Milan for which he had to apply for special authorization. Although he quickly became very successful and participated in many international exhibitions, he was never able to see them himself or for that matter go to any other country. Much of his visual culture was therefore acquired through journals and books as well as thanks to his lifelong dealer, Vittorio Grubicy de Dragon, who introduced him notably to the painters of The Hague School, particularly Anton Mauve, but also Jean-François Millet, the source of a profound influence on his art. 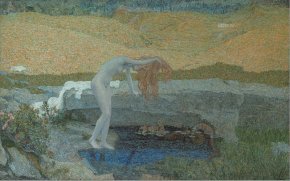 The first room presents what we might call Segantini before Segantini that is, canvases painted in Milan, when he first started out, before working in a divisionist manner, not with pure colour dots but with fine strokes which he juxtaposed. 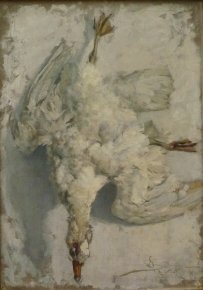 Here, there are already several masterpieces such as Lunar Effect (1882, Fred Tschanz collection), strongly influenced by Millet but in a very different tone, as well as White Gander (ill. 1) which we cannot help but compare to Oudry’s famous White Duck (stolen and never recovered, alas). Unfortunately, the catalogue lacks any entries and is very brief despite fine illustrations and some interesting essays so does not offer any help. 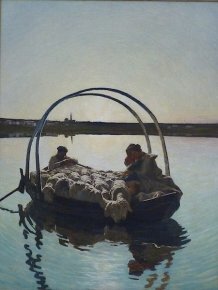 The painting is not analyzed and there is no explanation telling us if this analogy is a coincidence or if Segantini had known in any way of Oudry’s canvas, for instance through a reproduction perhaps. Another example of a fascinating painting which leaves us in the dark is The First Mass (ill. 2). It represents a priest standing on a baroque staircase, apparently meditating. Where is he ? What is he thinking ? 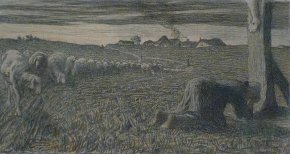 Why did Segantini paint this scene ? It remains a mystery. We also have here Ave Maria a Trasbordo, considered the artist’s first divisionist painting (ill. 3). This is a replica of a composition which was destroyed from a few years earlier representing a boat carrying sheep. The viewer has to look closely to perceive what will later become an emblematic characteristic of Segantini’s style, that is, how each stroke is divided into dabs of pure colour set down in parallel strokes. Contrary to general belief, this manner of painting does not come directly from the Seurat and Signac works which Segantini, who could not travel, had probably never seen. Rather, he developed his technique, strongly influencing the Italian Futurists later, thanks to the information provided by Grubicy, his friend and art dealer, concerning Choiseul’s theories and how they might be applied by artists. 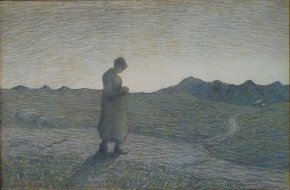 However, Segantini cannot be reduced to only one painting or only one style. In fact, it is important to go beyond the similarities and not jump to conclusions, for instance, saying that some bear Van Gogh’s imprint. If we were to establish any influence between the two, the authors here say it worked the other way around : the artist without a country exhibited abroad and was better known at that time than the older Dutchman who perhaps saw the first version of Ave Maria a Trasbordo at the Colonial and International Exposition in Amsterdam in 1883. The parallels might also be explained in models common to both found in The Hague School. Segantini’s themes deal essentially with peasant scenes and mountain landscapes. We should once again keep in mind the link to Jean-François Millet given the fact that some of the Italian’s canvases allude quite openly to this artist (ill. 4). He represents the poor but without dramatizing their misery, evoking the harmony between man and animals ; these scenes are silent and imbued with a certain mysticism (ill. 5), a reflection of his pantheistic philosophy of life. Segantini was always attracted to nature – leading him finally to his death from peritonitis during an outing in the mountains since he was not able to return to town in time to find a doctor. It was there that he painted the central section of his last masterpiece, a triptych (Life, Nature, Death) on deposit at the Segantini Museum in Saint Moritz, which was not able to travel to the exhibition for conservation reasons although large preparatory drawings are provided. We would also like to mention here Segantini’s works with Symbolist connotations, many of which are not exhibited in this retrospective such as The Punishment of Lust (1891, Liverpool, Walker Art Gallery) and The Evil Mothers (1894, Vienna, Belvedere). However, visitors will be able to enjoy Love at the Fountain of Life, Vanity (ill. 6) and several splendid drawings, for instance The Angel of Life. The last room presents the artist’s last paintings, when his divisionist style becomes even more pronounced, now easily identified – thus permanently marking his legacy in the minds of the general public as its salient characteristic. The painting we find most moving and most beautiful (ill. 7) brings together all of the elements which sum up Segantini’s originality, the representation of the work in the fields, the grandeur of the Alpine landscapes and the peaceful serenity which is slightly troubled by an indefinable concern, perhaps the sky with its surprising matter, a profound gray which seems on the point of turning unexpectedly into orange. Segantini’s paintings are mostly in private collections as shown by the ones assembled here for the exhibition. We hope that, despite their high price, Orsay may one day soon be able to acquire at least one as this artist is seriously lacking in the collections. In 2008, Guy Cogeval had announced, with some reservation, his plans for organizing a retrospective on the Italian painter. It seems this is no longer in the works. Curators : Diana Segantini, Guido Magnaguagno, Ulf Küster ; with the help of Fiona Hesse. Collective work, Segantini, Fondation Beyeler, 2011, 172 p., 68 CHF. ISBN : 9783775727655 (English edition), 9783905632866 (German edition). Visitor information : Fondation Beyeler, Baselstrasse 101, CH-4125 Riehen/Bâle. Tel : + 41 (0)61 645 97 00. Open every day from 10am to 6pm, until 8pm on Wednesdays. Rates : 25 CHF ; 12 CHF (reduced).